This is a good-look car. Long gone are the days of ugly Hyundais, but perhaps the best-looking of the Hyundai lot is the all-new i30. Especially when you look at how it’s progressed from the old i30. Penned by the considerably talented Thomas Bürkle, the i30 has a strong presence thanks to its aggressive, almost multi-surfaced lines. 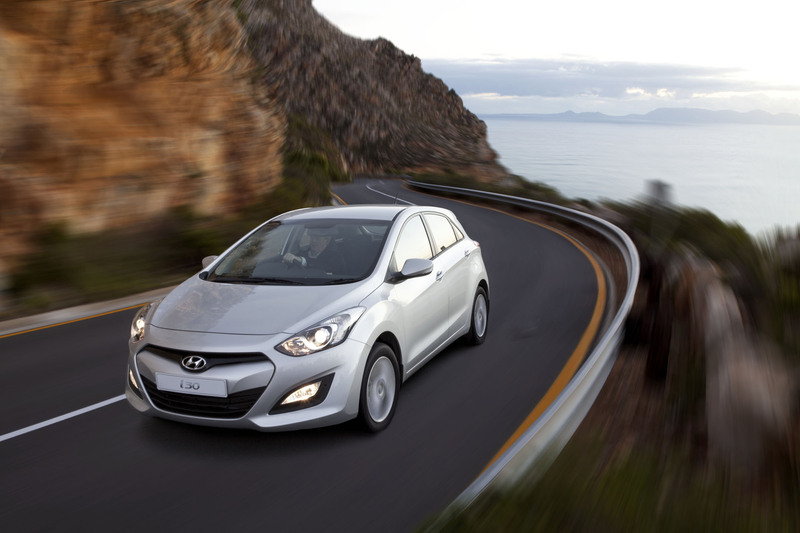 The large, hexagonal grille provides the i30 with an attractive nose, flanked by angular yet curvaceous headlights similar to those on the Elantra. Strong lines flow from the bonnet and wheelarches down the side and tie in nicely with the rear of the car. The taillights also remind one of the Elantra and the shoulderline dips attractively next to them, round off the stylish package nicely. The whole car is a brilliant interpretation of Hyundai’s ‘fluidic sculpture’ design language. But is that all there is to the new i30? Thankfully, it’s far from it. Yup, not only is the new hatchback almost as good to look at as Hedi Klum on a cold day, it’s a genuinely impressive piece of kit, too. The range consists of three petrol engines, two 1.6-litre units, one with a 6-speed manual gearbox and one with a 6-speed auto, and then a 1.8-litre mill that’s mated to a 6-speed manual. The 1.6-litre outputs sit at 95 kW of power at 6 300 r/min and 157 Nm of torque at 4 850 r/min, while the 1.8’s numbers are 110 kW at 6500 r/min and 178 Nm at 4 700 r/min. Those figures could be a little higher given the sizes of the engines, and I’m sad to report that the engines are, in fact, the weak point of the i30. They feel lacklustre and a bit, well, ‘pap’. Still, performance isn’t exactly painful, with the 1.8 taking 9.7 seconds to get to 100 km/h, the 1.6 manual taking 10.5 and the auto needing 11.5 seconds to complete the task. They’re pretty efficient, though, with the 1.6s using 6.0 l/100 km and 6.8 l/100 km for the manual and auto respectively, and the 1.8 requiring 6.5 litres to get 100 km. The gearboxes also aren’t great. There’s nothing technically wrong with the manual, but it does feel a little ‘loose’, but the auto is reluctant to change gears and, when it does, particularly through the odd mountain pass, it has an uncanny habit of doing it at exactly the wrong time. That, however, is where the criticisms stop. If you can get over the performance aspects of the car being a little weak, you’ll soon discover that the i30 not only looks the part, but is well put together, decent materials are used, it’s spacious and comfortable inside and it boasts a range of features as standard that it’s competitors make you pay for and, on top of all that, safety is respectable too, six taking care of passive safety and ABS, EBD, ESP, Vehicle Stability Management and Active Yaw Control doing the active job.